Although all teas come from the exact plant called Camellia Sinensis, there are hundreds of unique kinds of teas, with their own exotic taste, appearance, and aroma. The most popular types of tea today are green, white, oolong, black, and herbal. These types of teas refer to how a tea is oxidized, or fermented. By exposing the tea leaves to air, tea growers can expose special flavors and aromas from the leaves. Only a few years ago, white tea was cultivated in China. White tea is the most gentle and soothing taste of tea, and it can even taste elusive with unusual flavors like asparagus or bamboo. White tea also has several health benefits, including numerous antioxidants that help boost cardiovascular health, lower bad cholesterol levels, and manage healthy weight loss. Unlike white tea, green tea is unoxidized, which helps keep their important color. In China, green tea leaves are roasted or pan-fired to bring out more unique flavors in the tea. Green tea has a range of flavors, from smoky with a lighter body, or citrus-like. Green tea has enormous health benefits, such as high antioxidants with about 20-45 percent of polyphenols by weight. Did you know that Oolong tea means “Black Dragon” in Chinese? Oolong tea is semi-fermented, whereas black tea is fully fermented. Oolong tea was first created in China and Taiwan, where the oolong tea leaves are oxidized and then fired. Oolong tea has a wide range of flavors, with distinctive tastes and fragrances. Oolong tea is known to improve mental alertness and thinking skills, and it has plenty of antioxidants that may boost your metabolism by up to 10%. Black tea is the most reputable tea in the West, although it was originally cultivated in China and comes from the Indian regions of Assam, Darjeeling, and Nilgiri. Black tea makes a great breakfast drink or soft afternoon tea. In Europe, “estate teas” are the new trend, meaning that teas come from an estate or yard from a certain year. Like a nice glass of wine, estate teas have unique flavors depending on where they’re grown. At Finest English Tea, our black teas are specially crafted from the finest blends and estates; from Kenyan earl grey teas and Assam breakfast blends to flavorful Kenyan gold teas and exotic African teas. Browse our black tea selection at https://finestenglishtea.com/product-category/everyday-teas/. Tisane teas, or herbal and floral teas, refer to a large selection of plants and fruity infusions that present delicate and sweet tastes and smells. Many people who drink decaf coffee or caffeine-free products choose herbal teas; tisane is soothing for the body and makes an excellent drink for children. Many herbal teas have natural health benefits, such as Vitamin C and antioxidants. At Finest English Tea, we offer Herbal Range Teas with unique herbs and fruit, such as pure peppermint, lemon, ginger, and ginseng, pure chamomile, and many more. Browse our herbal range teas at https://finestenglishtea.com/product-category/herbal-range/. 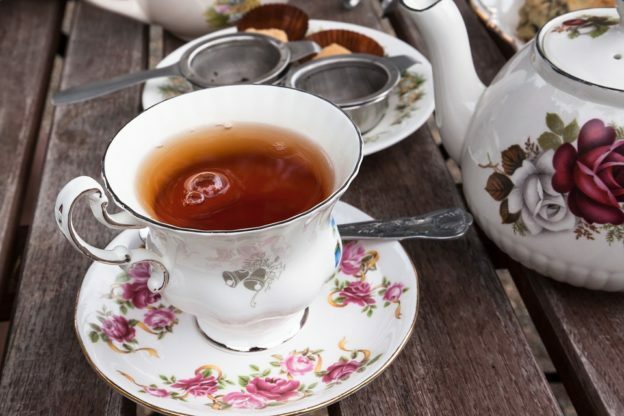 We hope you enjoy these 5 most popular teas around the world. For more information on Finest English Tea and our high-quality, unique tea selections, please call our toll-free line at 800.529-4954. This entry was posted in Uncategorized and tagged Top 5 Most Popular Types of Teas on 12/29/2017 by Andrew S..